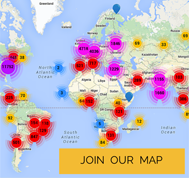 StartupBlink set out on a mission beginning in early 2014 to map and rank startup ecosystems across the globe. Our research is constantly improving as we’ve produced our long-awaited Startup Ecosystem Rankings Report while updating the Startup Ecosystem rankings frequently. Our report ranks 954 cities and 125 countries around the world based on their startup ecosystem strength, making it the world’s most comprehensive startup ecosystem ranking to date. Our rankings stem from thousands of data points gathered from various sources as explained in the sections below. Rather than focusing on traditional, well-known winners, we’ve highlighted hundreds of startup ecosystems across the globe to make sure that for the first time, each of the world’s top 1,000 cities and over 120 countries are ranked according to their startup ecosystem strength. Click here to download the full report which includes detailed explanation about our methodology, key insights from the rankings and screenshots of the Country & Cities table. For a complete list of ranked cities and countries, please visit the StartupBlink Ranking Table, where you can toggle between cities and countries or search for specific locations. Our initiative is ongoing and we will continue to periodically release updated ranking and reports. We’re excited to keep adding more sources to improve the accuracy of the rankings. Of course, we could not have built these rankings by ourselves. We are supported by dedicated Ecosystem Partners who help our maps stay accurate and relevant while developing their local startup ecosystem using our technology and databases. If you’re interested in providing data for your city, please contact us or sign up in the Ecosystem Partners page. Moreover, our rankings will become increasingly detailed as organizations and individuals, who take pride in their local startup ecosystems, add missing startups and other ecosystem relevant organizations (Accelerators, Coworking spaces, etc.). To add an entity (either yours, or any important missing undocumented entity in your city), click on the green “Add” button in the relevant section of the StartupBlink Global Startup Map. Our analysis is geared towards three primary audiences: entrepreneurs, municipal development offices, and national governments. Importantly, entrepreneurs can utilize our rankings to determine if a particular city has the resources needed to support their goals. For example, a founder looking to establish a startup in the southeast stretches of the United States would review cities such as Tampa, Atlanta, and Durham to determine their rankings and what incubators, accelerators, or fellow startups are located there. We believe entrepreneurs have only two choices that are logical: either they should relocate to a top ranked startup hub (E.g. San Francisco, London, Tel Aviv), or preferably, they should decide to take an active part in leading their active ecosystem. It simply makes no sense to stay inactive in a location that has low startup activity. At StartupBlink, we are also focused on community building and helping startup ecosystem grow by initiating a “Community Leaders” program with dozens of leaders organizing events in more than 70 local StartupBlink Chapters. Municipal and state governments have the unique ability to utilize our data as they curate economic development programs and startup initiatives. In an almost unanimous fashion, cities across the globe are working hard to attract startup talent as one of the best ways to create jobs and increase economic growth. The impact startup success has had on the economies of countries (e.g. Israel and Estonia) that not long ago were considered “Developing” is staggering. Helping local startup ecosystems grow requires building and fostering the resources that talented teams need. Our data points allow civic leaders the opportunity to review the resources their ecosystems offer, compare themselves to other regional ecosystems, and focus on essential areas of improvement. In turn, national development offices can review cities in need of business development or startup-related assistance, and address these needs accordingly. We determined it was critically important not to simply focus on the number of startups in a given city. We have taken advantage of the fresh data received on a daily basis on our map to also integrate special ways to determine the quality of startups as well (Special thanks to our partners in Similar Web who have greatly helped us with that aspect). But Quality and Quantity is not enough. As our team is remote, and yours truly is a nomadic CEO traveling the world (as seen on my blog and podcast BecomeNomad) we have learned that key players in any startup ecosystem also include coworking spaces, accelerators, tech reporters, and government-run startup support organizations. Our algorithm was developed to account for the quantity and quality of all these relevant startup ecosystem actors. Our initial rankings are based strictly on quantifiable data. While we believe there will be room for qualitative analysis in the future and welcome interview volunteers, we initially refrained from using tools such as surveys and interviews. Instead, we processed data accumulated on our map or published by external sources. Each location’s final score is based on the same mathematical calculation with no customization or additions per location. We built our algorithm to calculate and rank the situation as it is, and not based on our beliefs or assumptions. 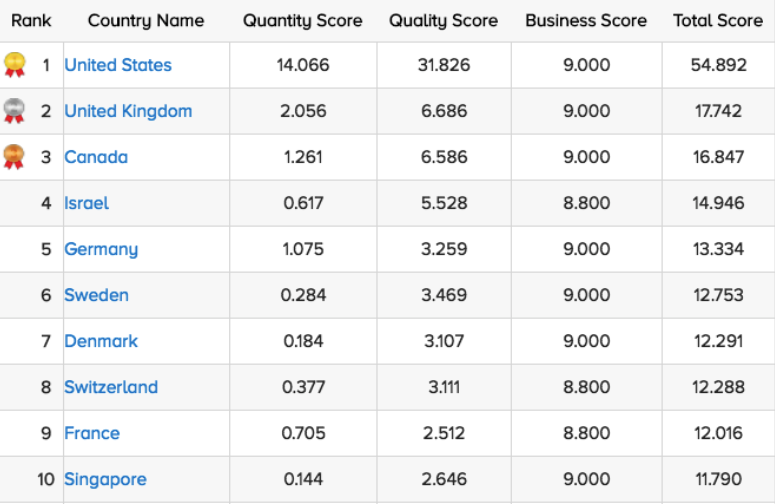 After reviewing our ranking tables you will notice three specific columns for each location: quantity score, quality score, and business score. These three scores are reflected by a summative assessment, the “total score”. You can read more about our methodology in the full report. The United States, United Kingdom, and Canada swept the top three spots in our global country rankings. Those top three prove that native English countries enjoy a major advantage in building global startups quicker than other countries that are not operating in English. The top three are followed by Israel and Germany close behind, and we expect to see some jockeying for top spots in the coming years. One thing is not expected to change any time soon. The United States position is as strong as it can be, and it doesn’t seem any nation other than China (Ranked 12th and rising fast) can imagine overthrowing it from the top any time soon. It would be interesting to see if the United Kingdom can preserve it’s exceptional ranking of being second, following Brexit. The United Kingdom main weakness is its reliance on one mega startup city (London is ranked 3rd globally) while its second city Manchester is only ranked 98th. Canada, surprisingly ranked 3rd globally (to the delight of the Canadian science minister), enjoys a variety of cities ranked in the top 50 global positions (Toronto, Vancouver and Montreal), which makes us estimate that it could surpass the United Kingdom and achieve the second ranked spot. Israel is the first non-English speaking country on the list, coming in at number 4. Known as the “startup nation,” Israel’s startup ecosystem has produced high-quality startups such as Waze, Viber, Payoneer, MobilEye and Wix. Germany closes out the top five, with its capital, Berlin, also ranking 5th in our global cities analysis. Currently enjoying a startup renaissance, Germany has three additional cities in the top 100. Impressively, they include Munich, 64th, Hamburg at 74th, and Frankfurt at 84th. Additionally, when reviewing startup activity per capita (taking into consideration population size), we found that small nations of less than 10 million inhabitants like Sweden (6th), Denmark (7th), Switzerland (8th), and Singapore (10th) placed in the top 10 (as well as the previously mentioned Israel). Scandinavian countries also display interesting regional competition. While Swedish entrepreneurs have built high-quality startups like Spotify, Candy Crush, and Minecraft, Denmark has supported new startup initiatives, Startup Bootcamp and Startup Weekend, for example. It may be surprising to see Switzerland at number eight in the rankings. However, the country’s stability and banking system seem to provide support and funding to help create high-quality startups. Switzerland has also produced a few unicorns (a startup company valued at over 1 billion USD), giving an additional boost to its quality rankings. France, unlike Switzerland, lacks in unicorns but makes up for it in the country’s overall quantity of startups. Singapore, another small yet powerful country, rounds off our top 10 list. It’s also the first Asian country to feature in the top 10. Rather than focusing on one specific ecosystem, our global rankings offer valuable insight into how countries fare in “distributing” their startup talent. This is helpful not only in determining how to increase the potential of a country’s overall startup ecosystem but also in showing how to allocate needed wealth, economic and business resources. The United States (with 19 cities ranked in top 50) and Canada (3 cities in the top 50), are doing very well in this area, while other top-ranked countries like the United Kingdom (ranked 2nd globally) only manage to have one city in the top 50, showing the dominance and importance of London in the UK startup ecosystem. Mexico ranks 30th, leading Latin America. Chile follows close behind, ranking 33rd, with Brazil coming in at 39th and Argentina at 40th. Europe fares well, boasting 20 European countries (including Russia) in the top 30. Asia is also building its momentum, led by Singapore (10th) closely followed by China (12th), South Korea (17th), and Japan (20th). Africa has 4 representatives in the top 60. South Africa is the first (38th), followed by Kenya, Egypt, and Nigeria (53rd, 54th, and 57th respectively). The StartupBlink report and map have recently been covered by the Hong Kong Economic Times, Forbes, and Business Insider. Check out our full press page for more articles on our approach. Moreover, our analysis is garnering attention from government officials. Here is an example from Canada’s Minister of Science and Economic development. Canada’s Minister of Science and Economic development. We’re constantly looking to improve our rankings and add value to future reports. We’d love to hear your thoughts on our findings and how you feel we could improve them. Please feel free to leave your comments below. Thanks! We’d like to thank Dr. Will Bennis (Ph.D., University of Chicago), and Dr. Shlomo David (Ph.D., University of Haifa) for their valuable advice and feedback on building an algorithm that best reflects and aggregates gathered data. We depend on your feedback to help improve the next version of the rankings, so please drop us a line is you have any suggestions. We would also like to thank our partners in the ANSYS Startup Program for supporting StartupBlink over such an extended period of time. Dr. Paul Lethbridge and Susan Coleman have both been a joy to work with, and our ranking and report would not have been possible without them. Thank you for reading, and don’t forget to review our research and download the full report here. I and my guys happened to be going through the excellent information and facts from your web page and before long came up with a horrible suspicion I had not expressed respect to the site owner for those strategies. My ladies were definitely for this reason happy to read all of them and have now very much been taking pleasure in those things. Appreciation for genuinely considerably considerate as well as for settling on this form of quality areas most people are really eager to be informed on. My sincere apologies for not expressing appreciation to you sooner.